The celebrated BBC TV dramatisation of a classic romance. 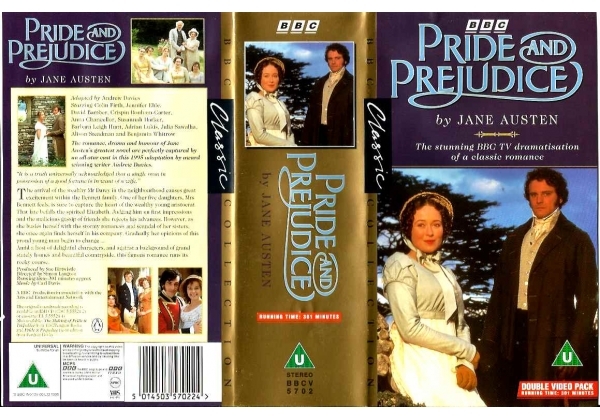 THE ROMANCE, DRAMA AND HUMOUR OF JANE AUSTEN'S GREATEST NOVEL ARE PERFECTLY CAPTURED BY AN ALL-STAR CAST IN THIS 1995 ADAPTATION BY AWARD-WINNING WRITER ANDREW DAVIES. "It is a truth universally acknowledged that a single man in possession of a good fortune is in want of a wife." The arrival of the wealthy Mr Darcy in the neighbourhood causes great excitement within the Bennet family. One of her five daughters, Mrs Bennet feels, sure to capture the heart of the wealthy young aristocrat. That fate befalls the spirited Elizabeth. Judging him on first impressions and the malicious gossip of friends she rejects his advances. However, as she busies herself in his company. Gradually her opinions of his proud young man begins to change...Amid a host of delightful characters, and a background of grand stately homes and beautiful countryside, this famous romance runs its rocky course. © A BBC Production in association with the Arts and Entertainment Network. The first BBC Video retail release from 1995. Or find "Pride and Predjudice" on VHS and DVD / BluRay at Amazon.